The 20 Postures used to create individual sequences of Whole-Body-Movement. 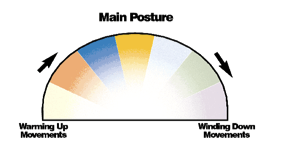 Devise programme plans of Postures in accordance with the YOU & ME Yoga colour-code system. A 25-minute DVD featuring the 22 Joint Looseners in relation to the 7 different coloured areas of the body. More than 800 line-drawing illustrations of people with special needs performing the looseners or adaptions of them in their own special way. Students with severe difficulties show how the YOU & ME Yoga system enables them to practise yoga and become more calm, relaxed and confident. Contains over 1,200 line-drawing illustrations of people with learning difficulties, of all physical types, performing the Postures or adaptions of them in their own special way. A book for both trainers and students with clear line illustrations showing how students of all ages and abilities learn how to improve their breathing. This 24 minute DVD-video was recorded at 19 venues including various special schools, adult training centres, and residential homes in the UK and Eire. It shows trainers using the system with their students with wide range of abilities, right across the age range. This gives the viewer an insight to the different ways in which YOU & ME Yoga has been implemented. This book is aimed primarily at therapsts, trainers and parents of disabled people. The book is enlivened by a variety of photographs illustrating an Indian adventure - investigating therapeutic value of yoga for disabled people in ashrams, schools and hospitals with eminent persons such as Gitananda, Iyengar, Desikachar, Janikiraman, Dr Bhole, Dr Gharote. And many other experts involved in Special Needs such as Dr P Jeyachandran, Director of Special Needs, Tamil Nadu. Dr P Jeyachandran initially implemented yoga therapy into the curriculum for training special educators and parents to teach yoga to children with severe learning difficulties. 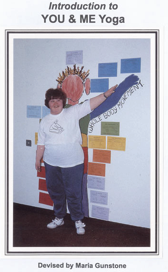 The book highlights: the origin and the principles of the YOU & ME Yoga system using sound, colour and Whole-Body-Movement, and the teaching materials that have been designed specifically for teaching yoga to people with learning difficulties/disabilities, of all ages and abilities. This book clarifies what is meant by the terms Down's syndrome and Autism. In addition, it deals with some of the different characteristics and abilities associated with conditions such as cerebral palsy, epilepsy, aural and visual impairment, and challenging behaviour problems. 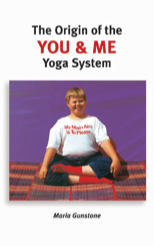 The book introduces the YOU & ME Yoga techniques used when working with students with special needs. It provides yoga case studies of students taught by the following YOU & ME Yoga Trainers and practitioners: a Snr. Physiotherapist, a Parent, a Community Nurse, a Deputy Head, a Lecturer in F. E., Day Services Officers, Yoga Teachers. It also provides teaching tips given by a Training Officer of Multiple Disabilities, a Principal of an F. E. College and a Snr. Educational Psychologist. This CD-tutorial is of the basic YOU & ME Yoga teaching techniques suitable for teaching people with Special Needs. It is recommended for yoga teachers and therapists, trainers and parents who have practiced yoga, or a similar discipline for at least two years. It's instructional-value conveys the aims and skills for teaching the 22 preliminary Joint Looseners, the 20 related Yoga Postures, and the basic relaxation and diaphragmatic breathing techniques. It enables trainers to experience and enjoy the practice of the system by distance learning in just over an hour, rather than attending a training course. It also allows for selection of anyone of the 44 tracks. Total of 64 minutes. The Display Cards are double-sided. On the illustrated side, the heading shows the name of the Loosener, and the instructions are given above the illustration of each stage of the movement. Notes are given at the bottom of the card to assist trainers. On the other side of each card there are benefits which can accrue from the Loosener, depending on the individual's abilities and the amount of practice. There are also cautions for students with specific health problems and guidelines for referral to the student's medical advisor before practice. The Looseners are used to assess the student's abilities. This in turn determines the likelihood of their being able to practice the related Posture mentioned on the card. This consists of a Colour-Code Guide Booklet, illustrating 20 Postures in seven colours. These are used to create individual sequences of Whole-Body-Movement to suit the needs of students of all ages and levels of ability. Correct diaphragmatic breathing is shown, also choices of Posture and the order in which they should be performed. There are also twenty A5 laminated Display Cards showing the Postures and giving simple precise teaching instructions with a note of physiological and psychological benefits and cautions. The protective lamination means they can be displayed and reused again and again. This Colour-Code Instruction Pack motivates learning by encouraging students to listen, look, recognise, describe, sort, select and arrange the different coloured postures into a structured sequence specifically for an individual's needs. It can also assist students to identify and name different parts of the body. This unique reference book explains how to devise individualised programme plans of Postures in accordance with the YOU & ME Yoga colour-code system. 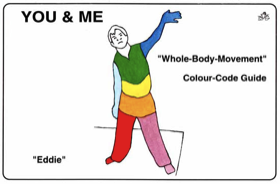 YOU & ME Whole-Body-Movement consists of sequences of Postures which are colour coded in the seven spectrum colours to represent areas of the body. This method ensures that the whole body is exercised and stimulated. The arrangement of Whole-Body-Movement sequences in this book deals with each Posture in turn and describes what is happening to the active parts of the body when performed. Each sequence is arranged around the 'Main' Posture and starts with a choice of Warming-Up movements selected to exercise the colour-coded parts of the body used within the Posture. The sequence is completed by a choice of Winding-Down movements in the remaining spectrum colours. 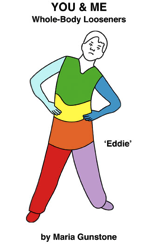 To enable trainers to appropriately select suitable techniques for their particular students' needs and abilities, a choice of warming-up and winding-down Postures is given for the different coloured bodily areas. Full explanations and rationale are given alongside each exercise. Relate to the classical yoga background of YOU & ME Yoga. Understand the use of colour to simplify learning. Explore different conditions affecting learning ability. Skilfully practise the basic techniques with knowledge of the object of the exercise and the connection between each coloured technique. 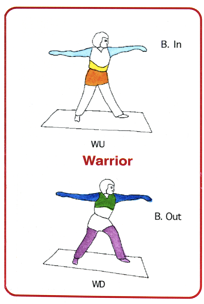 Arrange sequences of Joint Looseners and Yoga Postures using the display cards. Refer to the fundamental principles and rationale used for selecting and arranging sequences of individualised yoga programme plans. This 25-minute DVD-video with an interactive menu features the 22 Joint Looseners in relation to the 7 different coloured areas of the body. Instruction is given by a nursery teacher to young children and by Maria to a mother and her adult daughter. The book is also suitable for people in later years as the Joint Looseners will help improve mobility. 298 pages (7 coloured pages), sample pages. Relate to the physiological interactions, limitations and contra-indications of each Joint Loosener. Study of the Joint Looseners’ assessment procedure and assess one’s own performances. Perform the 240 modification techniques of the 22 Joint Looseners. Be aware of various causes of stress and tension. Identify three suitable clients with different abilities for case study. Assess client’s functional, physical and social skill performances of the Joint Looseners. Use the recording system to assess client’s functional, physical and social skill performances. Establish suitable and safe techniques, including modification techniques for the individual clients to safely work their joints. Teach clients’ Loosener programmes individually and in small mixed groups and keep practice records. This book is intended to benefit both the trainers and their students and was written with both parties equally in mind. There is a section specifically for students dealing with techniques that are appropriate for their level of understanding including: the basic relaxation technique; relating to body language; identifying the coloured bodily parts; sounds and sensory awareness; using imagination and being positive; outside activities 'tuning-in' to nature to improve well being and quality of life. This is followed by a related section for trainers with full rationale covering: stress and need for regular relaxation and recreation; various relaxation techniques; the affect colour has on mental, emotional and physical conditions as well as the consciousness; tips for making affirmations and the power of positive thinking to enhance the quality of being alive. This material is a wonderful resource for trainers. It can also be used to assist others to understand stress and to experience the benefits of guided relaxation, visualisation, affirmation and meditation techniques. Three stages of full-lung breathing with sounds (5.18). Sounds for spectrum coloured areas of the body the seven different colours of the body (2.43). 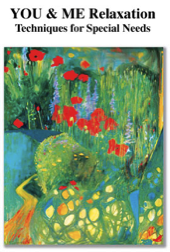 Yoga Nidra relaxation - conscious rest - with exploration of colour and sound to help relieve tension, develop relaxation, body awareness, mind-and-body awareness, and stimulate vitality (10.31). An ancient meditation song to enable body, mind and spirit to function in harmony. It is sung by Ritwik Sanyal, the professor of Dhrupad, the oldest and finest surviving tradition of Indian music (27.25). This 90-minute DVD-video with an interactive menu features the YOU & ME system of Yoga, using sound, colour and Whole-Body-Movement. Instruction is given by practitioners of the system, using adaptations appropriate to their students, and also by some of the more advanced students themselves. Even those who normally show very little response demonstrate here how they are able to practise yoga and become more calm, relaxed and confident. There are over 1,200 line-drawing illustrations of people with learning difficulties, of all physical types, performing the Postures or adaptions of them in their own special way. Specifically for students covering techniques for awareness and to improve breathing. Theory and process of breathing, and benefits of breath control therapy. Relate to the physiological interactions and contra-indications of the Yoga Postures. Study of the Yoga Postures’ assessment procedure and assess one’s own performances. Perform the 460 modification techniques of the 20 Yoga Postures. Progress clients from preliminary techniques to Yoga Postures. Assess the client’s functional, physical and social skill performances of the Yoga Postures. Select suitable Postures and variations for each client’s needs and abilities. Teach clients sequence of Yoga movements, individually and in small mixed groups and keep practice records. Assess, monitor and evaluate client’s skills and outcomes of their Yoga practice. Relate to the breathing techniques for special needs and practice each one. Relate to the process of breathing and benefits of breath control therapy. Progressively practise and observe effects of the therapeutic breathing techniques for continuing professional development. Assist clients to increase awareness of their breath. Select and teach appropriate breathing techniques for each client to help improve breath control. Assess, monitor and evaluate client’s skills and outcomes of their breathing practice. Relate to the relaxation and mindfulness techniques for special needs and practice each one. Relate to causes of stress and to techniques to help combat stress. Practise and observe effects of the various advanced relaxation techniques for continuing professional development, along with consideration of such to benefit others, such as family, friends and peers. Select and teach suitable relaxation techniques to the three clients. Assist clients with awareness and understanding of their body. Select and teach suitable relaxation techniques for each client's needs and level of understanding. Assess, monitor and evaluate client’s ability and progress to relax. A learning guide is provided for each module, as a Word document to complete and return on-line. It guides you through the reading material and asks questions. It enables you to link your skills and knowledge to teach the system using three case studies. The Learning Guide is split into short, sections so you can fit the study and practice into your life. Tuition includes learning support for up to two hours (see learning outcomes) to suit requirements, by arrangement with Maria Gunstone. Followed by assessment of coursework sent online to: maria@youandmeyoga.com.